We’d love your help. Let us know what’s wrong with this preview of Spirit Hunters by Ellen Oh. We Need Diverse Books founder Ellen Oh returns with Spirit Hunters, a high-stakes middle grade mystery series about Harper Raine, the new seventh grader in town who must face down the dangerous ghosts haunting her younger brother. A riveting ghost story and captivating adventure, this tale will have you guessing at every turn! 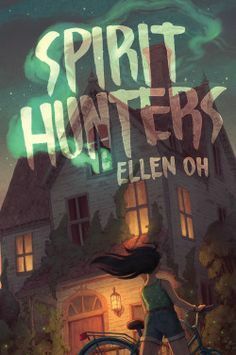 Harper doesn’t trust her new home from the mome We Need Diverse Books founder Ellen Oh returns with Spirit Hunters, a high-stakes middle grade mystery series about Harper Raine, the new seventh grader in town who must face down the dangerous ghosts haunting her younger brother. A riveting ghost story and captivating adventure, this tale will have you guessing at every turn! To ask other readers questions about Spirit Hunters, please sign up. can i get it for free? Not sure why there's all these "too childish" 2/3 star reviews. This is middle grade which means the target audience is 9-12 (in most cases). It is meant for children. When reviewing MG you need to be thinking from the perspective of the target audience, not yourself (assuming reviewer =/= target audience). I know Oh's first series was YA so some of her YA readers may be picking up this new book (being a fan of the author), but please remember this is middle-grade, not YA or adult. If the writing Not sure why there's all these "too childish" 2/3 star reviews. This is middle grade which means the target audience is 9-12 (in most cases). It is meant for children. When reviewing MG you need to be thinking from the perspective of the target audience, not yourself (assuming reviewer =/= target audience). I know Oh's first series was YA so some of her YA readers may be picking up this new book (being a fan of the author), but please remember this is middle-grade, not YA or adult. If the writing is "too childish" you probably shouldn't be reading it. All the elements here were pretty familiar, especially the Michael/Billy plot, and the most original bit with the long-dead Grady wasn't elaborated enough. That aside, the writing and characters were solid and it was a very enjoyable read. I think this would be excellent for a kid or even adult who hadn't already read a lot in this genre, and I'm certainly open to try something else by this author. Wayyyy too scary for me! Very middle-of-the-road middle grade fiction. Not the book's fault, this genre is just not for me. The writing style of this kind of annoyed me. I sort of expected "a bit childish" which I'd consider fine for an MG novel, but the “she felt angry” kind of style started to annoy me pretty quickly. The only new or original thing offered here is the Asian lead characters and general diversity, which I did appreciate. 20/10 excellent for middle grade readers. The new house is unbearably hot because of broken air conditioning, except for 4 year-old MIchael’s room, which is unnaturally cold. And Michael claims to have made a new friend in his room named Billy that no one else can see. Slowly, Harper begins to see her brother change from a sweet, loving little boy to a mean, violent child who only wants to stay in his room with Billy. When Harper mets Dayo, a Jamaican girl who lives a few blocks away, they become instant friends. Days knows some of the odd history of Harper’s new house, and tells her it has always been considered to be haunted. As something evil and malicious takes over Michael more and more, Harper and Dayo research on the house’s history and discover some really frightening information. And it helps when Harper reconnects with her old friend Rose, a ghost who lives in a family mirror, and who can help figure things out. At the same time, Harper begins to remember more details about the fire and her accident at Briarly. And she is beginning to see glimpses of Billy, the boy possessing her brother. But what can two 12 year-old girls and a sweet ghost do in the face of such evil? Luckily, Harper’s estranged grandmother lives nearby and shows up suddenly. Grandma Lee is a Korean mudang or shaman, and her belief and work in the spiritual world is what has alienated Mrs. Raine from her mother. She immediately accesses the situation with the house and especially with Michael, who by now is almost totally possessed by Billy. And she informs Harper that she too is a mudang, and it is up to her to exorcise the house and her brother. But does Harper’s understand her newly uncovered ability as a spirit hunter enough to go up against such a strong malevolence. Spirit Hunters is a fast read simply because you can’t put it down, the need to know what happens next is just too great. Even though the story covers only 10 days, Oh manages to build the tension slowly, beginning with a playful insinuation of creepiness and working up to almost full scale horror. Some of the tropes she used are a bit cliché, like oozing, bleeding walls, or floating ghosts, but these by no means diminish the delicious pleasure of the story for fans of scary tales. Oh's writing is friendly and pretty straight forward, but I liked that in-between the third person narrative are Harper’s first person journal entries. These allow the reader to directly know and understand what she is feeling and thinking, and which also slowly reveal the blocked events surrounding the fire at school and the accident at the psychiatric hospital as they resurface in Harper's memory. And I liked the way Oh introduced Harper’s Korean identity on her mother’s side of the family (her father is clearly not Korean). In Spirit Hunters, Harper begins to explore more fully this part of who she is and, I hope, it will expand subsequent books in this new series. Spirit Hunters takes place in Washington DC and you couldn’t ask for a better ghost story location (except maybe New Orleans). There’s just something about those old homes, the sidewalks inlaid with bricks, and the heat and dense humidity of summer that can be cut with a knife that all just lends itself to a well-done scary story. If you want a good hair-raising scare this summer, do pick up a copy of Spirit Hunters and enjoy. Harper Raine has a bad feeling about her family’s new home the moment she steps inside. Then she hears the rumors about the house. And to top things off, her little brother begins acting strangely. Now Harper is spending seventh grade seeking answers to the spirits she senses and trying to figure out a way to save her brother before it’s too late. This is a fun debut to a new middle grade series! Tune in to our weekly podcast dedicated to a Harper Raine has a bad feeling about her family’s new home the moment she steps inside. Then she hears the rumors about the house. And to top things off, her little brother begins acting strangely. Now Harper is spending seventh grade seeking answers to the spirits she senses and trying to figure out a way to save her brother before it’s too late. This is a fun debut to a new middle grade series! I can't get over the fact that this is a middle grade book. This was so creepy!! I loved the Korean spiritual references and how the haunting was described. I do wish the parents were more aware of the haunting so that the protagonist could have a moment of "I told you so", but other than that, this was a fun and creepy read! Harper and her family have moved to Washington, D.C., and Harper hates their new place. Something is just not right about it. Harper learns her home is supposedly haunted, and starts to have a feeling of déjà vu. As Harper's feeling of unease increase, so does the erratic behavior of her younger brother. Harper is missing some memories, and slowly, some start to return to her as she focuses on helping her brother. A middle grade ghost story. Fun, spooky, and entertaining. Great for fans of ghost Harper and her family have moved to Washington, D.C., and Harper hates their new place. Something is just not right about it. Harper learns her home is supposedly haunted, and starts to have a feeling of déjà vu. As Harper's feeling of unease increase, so does the erratic behavior of her younger brother. Harper is missing some memories, and slowly, some start to return to her as she focuses on helping her brother. Review originally published 26 June 2018 at Falling Letters. Spirit Hunters, the first book in an upcoming series, is a classic haunted house tale with a Korean-American perspective. (This book is #ownvoices for Korean-American representation.) Harper’s family has just moved from an air conditioned apartment in New York to a stuffy old house in Washington D.C. Harper knows the move has something to do with a fire at school and a serious accident that put her in hospital, but she has no memories o Review originally published 26 June 2018 at Falling Letters. Spirit Hunters, the first book in an upcoming series, is a classic haunted house tale with a Korean-American perspective. (This book is #ownvoices for Korean-American representation.) Harper’s family has just moved from an air conditioned apartment in New York to a stuffy old house in Washington D.C. Harper knows the move has something to do with a fire at school and a serious accident that put her in hospital, but she has no memories of the incident. Harper is wary of her new home, especially when she learns of its’ supposedly haunted past from her new friend Dayo. When Harper’s usually sweet little brother Michael starts acting sullen and mean, Harper and Dayo begin investigating the history of the house in an attempt to uncover the root of Michael’s behaviour. Harper unblocks her memories halfway through the book, remembering everything that happened around her accident as well as the critical fact that she can see and communicate with ghosts – a skill that Harper will need to use to her advantage if she wants to save Michael from a nasty ghost’s possession. What sets Spirit Hunters apart from other middle grade books with ghosts is that Spirit Hunters feels properly frightening. The sharp change in Michael’s personality demonstrates the threat that Billy, the older boy who haunts the house, can be. As Harper and Dayo uncover more of Billy’s history, they learn just how awful he was when he was alive. Billy is a real threat to Harper and her family, and the creepy happenings he raises around the house invoke the same kind of chills I experience when reading adult haunted house stories. In addition to being a ghost story, Spirit Hunters deals with themes of cultural identity. Harper is Korean-American and has a Korean grandmother who lives near Washington, but whom she’s rarely met because her mother and grandmother are estranged. Harper eventually reconnects with her grandmother and learns that she is a mudang, a shaman who can hunt spirits, and that Harper has the same ability to do so. Family conflict arises because Harper’s mother does not have that ability and denies the existence of ghosts. Racism is also addressed, not as a primary theme in the novel but something that Harper, as a visible minority, has to deal with in her everyday life. A creepy, haunting middle-grade book, the first in a series, and I definitely want more books. This one lays the perfect foundation for a whole lot of creepy, spooky stories. I am always on the lookout for new horror/ghost stories, especially in the middle-grade/childrens range. Often those books avoid the scariness or weaken it as the story goes on. But not this one. Oh no, I was definitely creeped out many times, and even NOPE NOPE NOPEd quite a few times (dang that spider/ghost thing on the wal A creepy, haunting middle-grade book, the first in a series, and I definitely want more books. Oh no, I was definitely creeped out many times, and even NOPE NOPE NOPEd quite a few times (dang that spider/ghost thing on the walls and ceiling or that stuff in the attic). Yep, that is fuel for nightmares, especially with how well the author writes the scenes. Not only do we have the sense of dread, the spooky house, and a brother (almost) possessed, but we also have a bit of memory loss and what those memories contain. I am really thankful that the author wrote them so well, didn’t hurry with the revelation, I would have been disappointed otherwise considering how big of a deal it is and how much it matters to the story. Harper is a wonderful character, strong, brave, and I was worried about her, and also felt sorry for what happened to her, to her lost memories. The house was positively spooky, and I was amazed that no one else seemed to notice. I know, I know, they don’t have any powers, but I would think anyone would feel the dread seeping from the walls. Not the least with how the little brother is acting totally out of character. There were a few moments that were quite obvious (the ghost in the house, but also who the great spirit hunter was), but eh, it is still a childrens book. It wouldn’t be the first time that things like that are obvious. Extra love go to Dayo, she was the best, and I hope we will see more of her (and hopefully she can help Harper out) in the next books. Yuna, the mom, I am still not sure what to think of her. On the one hand I can understand why she did what she did, but on the other hand… I just can’t and I was pissy at her for a few parts in the book. I loved it when those characters appeared in various parts of the story. Haha, yeah, I won’t tell you who, or what, as that would spoil something, and I don’t want that to happen. The last chapters were a rollercoaster and I was on the edge of whatever place I was sitting. It was spooky, creepy, and I was afraid for Harper. Would she be able to do it? What would happen afterwards? Highly recommended if you are looking for a spooky, creepy, twisty book with great characters. Harper's family moves from New York City to Washington, D.C. and end up in a decrepit old house. Harper has had problems at school-- she was accused of setting fire to the art room, and was hospitalized for some time, but she doesn't remember any of it. She notices that her four-year-old brother Michael's room feels oddly clammy, and he claims to have a "new friend" named Billy who tells him things that cause him to have headaches. Harper does manage to meet a neighbor girl, Dayo, so she has someone to help her investigate when things get odd. Harper has two bad accidents in one week; she is pushed down the stairs, and also cuts herself on an old metal fire truck. Dayo does some online investigating and finds out some very creepy things about the house, and Harper reconnects with her own "imaginary" friend Rose who inhabits an antique mirror. Things escalate with Michael, and Harper's estranged grandmother finally visits the family and not only helps Harper but gives her the surprising news that she is a spirit hunter who can communicate with ghosts. Grandma Lee is a mudang, a shaman who has worked with the spirit world for a long time, which is the source of the rift between her and Harper's mother. Can Harper save her brother, make the house safe, and come to terms with her inherited skills? Strengths: No wonder middle school students don't want to move! All of the houses people move into are haunted! Bonus points to Oh for managing to add some new twists to this trope with a benevolent ghost friend, an unexplained hospitalization, and a Korean grandmother with interesting skills. Add to this standard family dynamics (busy older sister, young brother who requires babysitting), supportive and involved parents and a new best friend whose mother is a chef, and this was a fantastic story about ghosts, family, and figuring out personal identity. Really enjoyed this one. Weaknesses: It was a little hard to believe that Harper's mother was so averse to the idea of ghosts, since Harper's and Michael's behaviors were so erratic, but I suppose if you grew up with a mother who was a shaman, it might warp you a little. I am confused about what I feel about this book. Reading it was like going through an emotional rollercoaster where I wanted to buy it or throw it away in the trashcan. To be honest, it's a pointless novel. I think even the novelist was confused about what to write. I am just glad that I finished it after promising myself a treat of hot coffee. this was a fun read. I like the scary aspect, although it was a bit predictable and too scary. but the writing was a bit off for me, reading as too childish or too adult at times. still need to gather my thoughts better on this one. I got the creeps reading this 😱😱😱. but on top of the ghost story there's also a story of family, friendship, and a girl coming into herself and her potential. This book is so CREEPY!!! I could NOT put it down and had to know what happens. You will devour this book! SPIRIT HUNTERS is unbelievably creepy and hauntingly gorgeous at the same time. Ellen Oh sets a high standard for middle grade literature, and I can’t wait to continue the series. This book was an absurd amount of fun. Creepy and interesting with a great cast of characters. This is exactly the type of book I loved when I was a kid. This review has been hidden because it contains spoilers. To view it, click here. Thanks to Edelweiss Above the Treeline for the sneak peek. Spirit Hunters hit the bookshelves yesterday. The first of what looks to be a series of middle grade books about a highly attuned 12 year old girl named Harper, I thought Spirit Hunters was "okay." Do I think my students will disagree with me and not be able to put it down? Yes. I wrestled with the rating on this one. The truth is, I didn't find the writing to be sharp. Yes, the book is geared for a younger reader. No, the writing should Thanks to Edelweiss Above the Treeline for the sneak peek. Spirit Hunters hit the bookshelves yesterday. The first of what looks to be a series of middle grade books about a highly attuned 12 year old girl named Harper, I thought Spirit Hunters was "okay." Do I think my students will disagree with me and not be able to put it down? Yes. I wrestled with the rating on this one. The truth is, I didn't find the writing to be sharp. Yes, the book is geared for a younger reader. No, the writing shouldn't talk down to them. I found it to be simplistic and lacking the beauty of words that so many books in this age range possess. For this reason alone, I cannot rate it higher. We have to aim high with kids. Period. That doesn't mean that Spirit Hunters doesn't have its merits. There are the multicultural characters peppered throughout the book. Ellen Oh is, after all, the champion of diverse characters in kids' books. While I didn't find the writing to have rich language, imagery and complex characters, I know that the creep factor for a 9 or 10 year old reader will mean that he/she will read this one way past bedtime. That's a good thing. I also liked how the chapters went back and forth between journal entries (Harper's viewpoint) and the events in the story (3rd person). This allowed the reader to take in more of what was going on, and might allow a teacher or another adult to jump into a conversation about reliable narrators. I did have a few grievances about Spirit Hunters, too. First, why must the character mention that her family sued the hospital and that the money was put into a trust (enough for her to live on for the rest of her life?) Perhaps this is a personal pet peeve, but I believe that our society has run rampant with the act of suing and to mention it so glibly in a children's book only serves to normalize the overuse of our court systems. I also did not like the plugs for Starbucks, KFC, and Popeye's. Again, I admit that this might be a personal pet peeve but our country simply does not sit around a home cooked meal in the way that I was raised to do night after night. The mention of these fast food restaurants in a kids' book felt not only planned but also a bit predatory. We know that our families are pushed for time. Between the need for both parents to work, the high divorce rate, and the over scheduling of children's "free time," our kids find themselves sitting with a kids' meal and a toy all too frequently. The obesity rate in our country echoes this. I don't believe giving it the cursory thumbs up in a children's book will help the growing epidemic. Thirdly, when Madison's sister breaks her nose it is mentioned by her parents that she wants a nose job. Really? In a children's book we are going to normalize the epidemic in our country of plastic surgery being the magic elixir? Perhaps in the next planned book (my final grievance) her sister will want breast surgery...Finally, why must our kids' books turn into yet another series? Can't we learn from the "Cars" and "Toy Story" movies and just enjoy the good old fashioned stand alone book? Okay. That's enough preaching. I'm hopping off of my soap box. Will my kids love this book? Yes. Will I book talk it after purchasing it for my classroom library? No. I'm a little bit of a horror wimp, but this book was too scary for me to read at night when my husband wasn't home..! Harper and her family have just moved into a historic house in Washington DC and Harper hates it. But she's pretty crabby all the time these days. Ever since the accident with the fire at her school that caused her to lose some memories of that time in her life, Harper hasn't felt quite right. There's something else not quite right with this house. Her little brother Michael seem I'm a little bit of a horror wimp, but this book was too scary for me to read at night when my husband wasn't home..! Her little brother Michael seems to be talking to someone that none of the rest of them can see. And his room gets mysteriously cold, even when the rest of the house is sweltering because the AC is on the fritz. And then Michael starts acting really strange. He used to be such a sweet kid, but now he's acting horrible. Harper's mom blames the stress of the move, but Harper knows that's not it. Can Harper figure out what's going on in time to save her little brother? And will she ever remember what happened to her in the fire that some people think SHE started? This book reminded me a lot of the scary books I loved to read as a tween. Although there are tons of stories about haunted houses, details about Harper's Korean-American family and portrayals of racist microaggressions make this book stand out. I'm going to say more like 3.5 stars on this one. I really enjoyed it, but I don't see myself re-reading it in the future. Also, being middle grade it reads young and I could see all the twists coming a mile away. Still very engaging, something I read in one sitting. I'd mostly recommend for ages 9 to 14. I think that'd be the perfect age group for this one. Well, Spirit Hunters might have been my first book from Ellen Oh, but it won't be my last. (As long as she's doing more MG. No urge to read her YA stuff.) This was a seriously creepy middle-grade read that had me all wrapped up in what was going on. I started reading it with my eight year old, but at a chapter a night, by the time we hit the third chapter, I asked her if I could read a little bit ahead after she went to bed. Had to promise I'd still read it with her, but an agreement was reached Well, Spirit Hunters might have been my first book from Ellen Oh, but it won't be my last. (As long as she's doing more MG. No urge to read her YA stuff.) This was a seriously creepy middle-grade read that had me all wrapped up in what was going on. I started reading it with my eight year old, but at a chapter a night, by the time we hit the third chapter, I asked her if I could read a little bit ahead after she went to bed. Had to promise I'd still read it with her, but an agreement was reached. My 'little bit ahead' ended up being me finishing the book. Spirit Hunters isn't a perfect book. The dialogue isn't fantastic. Some of the more intense scenes really felt like they were a bit much for something I would let a nine to twelve year old read. (view spoiler)[Like the scene where the girl from the mental institution is telling Harper stuff to try to get her to hurt herself. With bloodied clothes and a head resting to the side on a neck that's clearly broken. (hide spoiler)] But, then again, I read The Archived with my child when she was like 7 or so, so I have no room to talk. Still, I was definitely surprised at how dangerous things got for Harper. But I was happy too, because the way this book unfolds is a perfect path to my happy spot. But even though things got intense, in other ways, this is a great middle grade horror. It's an introduction to a basic, well-loved, horror story that's got all the 'boring bits' pared away from it. Spirit Hunters thrusts you right into the middle of a situation that even a young reader can tell is not quite right, and quickly goes from there. My child thinks that Billy is just Michael's imaginary friend. Just not a nice one. Goodness is she going to get a shock a few chapters from where we are together! There's also no foul language or any type of adult scene that they shouldn't encounter. As previously mentioned, the elements of Spirit Hunters are familiar ones. (view spoiler)[Evil spirits. A child getting possessed. Time in a mental institution. Family not believing you. Etc. (hide spoiler)] But Ellen Oh writes them with a flair that makes you want to keep reading. I liked Harper's sidekicks (both of them). I also liked the fact that it is Harper (and sidekicks) that ultimately fixes the problem. Yes, she has help from an 'unexpected' source, but the meat of the fix was on her. And she wasn't super-powered, either. Without her friends' assistance, she would have probably not made it out of the situation okay. Into a fun, scary spooky read for my 5th/6th graders—this one starts off with a twelve year old named Harper who has moved to Washington D.C. with her parents, older sister and younger brother (just like me! And just like most middle children her relationship with each of them depends on the time and situation..No better role model than an older sister and no better partner in crime than a little brother…Her family moves to an old, abandoned house steeped with suspense…. You learn of Harper’s mysterious past after she had a traumatic accident, suffered two broken arms, ribs and a collarbone all from a fire that she or her school has no idea how it happened…Also as they moved into their new house her little brother Michael finds a new friend; only he is imaginary, evil and possessive and Harper is finding scary similarities to her own nightmares of a friend who controlled her. Harper’s new friend Dayo insists that the house is haunted and that Harper should take her questions and concerns about ghosts seriously and after she is mysteriously pushed down a flight of stairs in one incident and being slashed to the point of twenty-five stitches in another incident Harper and Dayo agree this is not a normal situation.. It gets really intense as Harper’s memory returns and she recalls being possessed by ghosts before both evil (like the ghost who set the school on fire and framed her) and good (like her own long lost forgotten mirror-residing ghost friend Rose). Because of the spiritual awareness and bright aura they possess both Harper and Michael can see ghosts and the ghosts can control them..Little Michael’s friend Billy is definitely evil and he turns Michael into a mean, violent and erratic brat that her parents somehow tolerate though can’t understand who lashes out at his sisters with Harper’s accidents and a dead mouse in older sister Kelly’s bed..To save her brother she must do the thing she can’t even believe she can do which is talk to ghosts and she decides to visit a graveyard. Of course, Ellen Oh tells it so much better than I just did. This book scratches an itch for readers between ages 9-12 looking for a scary story. It's not gross or bloody, and it would be perfect for students looking for a creepy scare that won't keep them up at night. Harper is a sympathetic narrator who risks her own life to help her brother without a second thought. BONUS POINTS FOR: Diverse characters. Harper's Korean grandmother (we have lots of Korean students in my school), and Harper makes a new friend named Dayo, who is Jamaican. WHAT CONFUSED ME: What was with the 16-year old sister constantly studying for the SAT? What sixteen-year old would study for the SAT that much? What was she really doing in her room all that time? I kept hoping maybe she had a ghost in there, too. THE BOTTOM LINE: This creepy ghost story is well-crafted and perfect for young readers looking for something creepy but not bloody. This will be super-easy to booktalk with sixth graders in my library. STATUS IN MY LIBRARY: We don't have it, but I plan to get it. 12-year-old Harper has just moved from NYC to Washington, DC. Strange things begin happening from day 1 in her new house. What begins as her 4-year-old brother's imaginary friend, quickly becomes something much more sinister. When she begins researching the history of her new home, she finds that it has a morbid past. An evil still lurks there and Harper is forced to recall her own memories of imaginary friends and evil spirits, in order to help her brother. As her brother worsens, Harper realiz 12-year-old Harper has just moved from NYC to Washington, DC. Strange things begin happening from day 1 in her new house. What begins as her 4-year-old brother's imaginary friend, quickly becomes something much more sinister. When she begins researching the history of her new home, she finds that it has a morbid past. An evil still lurks there and Harper is forced to recall her own memories of imaginary friends and evil spirits, in order to help her brother. As her brother worsens, Harper realizes that it is up to her to figure out how to save him from the evil. A delightfully creepy read starring a spirited seventh-grader named Harper. Harper and her family have just moved to Washington, D.C. and in addition to having to deal with leaving her friends behind, Harper has to deal with her missing memories, trying to get her mom to agree to let her see her grandmother again, the weird way her little brother has started acting, and the fact that she lives in a haunted house. But Harper stays strong through it all, and with some help from her friends, she is A delightfully creepy read starring a spirited seventh-grader named Harper. Harper and her family have just moved to Washington, D.C. and in addition to having to deal with leaving her friends behind, Harper has to deal with her missing memories, trying to get her mom to agree to let her see her grandmother again, the weird way her little brother has started acting, and the fact that she lives in a haunted house. But Harper stays strong through it all, and with some help from her friends, she is able to follow in the footsteps of her grandmother, a mudang or Korean shaman, and become her apprentice and a true spirit hunter. Opening Line: "Harper! Come quick!" Spirit Hunters was a lot creepier than I thought it was going to be, which made it a wonderful story for me cause I love creepy scary things. There are multiple incidents of Harper being injured by the presence in the house, and her younger brother Michael being taken over by a supernatural presence, yeah just creepy. I did really like the diversity and the touching and realistic relationship between the siblings. I did wish that more had been written about Har Opening Line: "Harper! Come quick!" Thanks for checking out my author page! I'm no longer checking notifications here on Goodreads but you are welcome to contact me on twitter or my blog and you can find a detailed bio here.